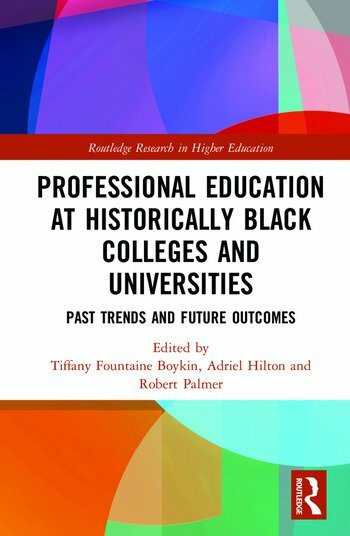 This book focuses on the significant role that professional education programs play at historically Black colleges and universities (HBCUs) and these programs’ impact on society. Chapter authors discuss the contexts and experiences of students who have attended these programs, including their relationships with faculty, research opportunities, professional growth, personal enrichment, and institutional support. Taking into account social supports, identity development, and doctoral student socialization patterns, this book sheds light on what development and status of such professional education programs mean for future research and practice, while emphasizing issues of race, oppression, and marginalization. Tiffany Fountaine Boykin is Assistant Director of Student Services at Anne Arundel Community College. Adriel A. Hilton is Director of the Myrtle Beach Metropolitan Campus at Webster University. Robert T. Palmer is Interim Chair and Associate Professor in the Department of Educational Leadership and Policy Studies at Howard University.